This odd looking thing is an actual aluminum mold used to create the first production-scale prototypes of Kenner's X-Wing fighter toy. Well, it was used to create part of Kenner's X-Wing fighter toy at any rate. If you haven't figured it out yet, the piece of the X-Wing that this corresponds to is the plastic "cap" that fits onto the back end of the vehicle and helps to hold the two halves of the fuselage together. 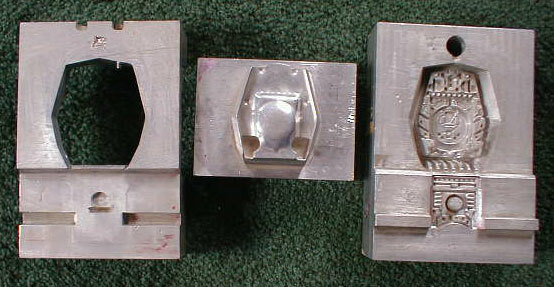 In this first image you see the two halves of the mold, along with an example of the production part (which came not from this mold, but from a steel production mold). As you can see, the central portion of the mold half that is responsible for the undetailed half of the part, or the half that is not visible on the toy's exterior, includes a sort of insert, which, for lack of a better term, "stamps" the plastic once it's been injected into the cavity, leaving it thin and formed to the correct shape. Here's a third shot of the two halves together, with the insert separated off to the left. This last image shows the mold beside the piece that was used to create it, the original 2-up wood pattern. The 2:1 scale of the pattern is typical; the larger size allowed the pattern makers to bring a greater degree of precision to their work. However, working in this scale created a prototyping problem: since the piece was larger than the intended production scale, any hardcopies made using it would also be two times larger than the actual toy. 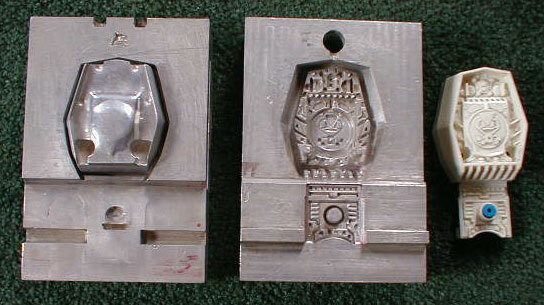 So, in order to create production-scale prototypes of the piece, for pre-tooling use in testing, presentation, etc., the pattern had to be subjected to a pantographing process, in which it was simultaneously diminished in size and translated into a metal prototype mold like the one seen here. In the creation of such molds, which served only to produce in-house prototypes, Kenner used aluminum, a cheaper and less durable alternative to steel, the standard material for producing production molds. As you can tell from the image above, the details of the pattern and mold are the same, but the scale of the mold is greatly reduced. This is the only Star Wars era aluminum prototype mold I've ever seen. It's actually a blessing that it survived, as most of these things were scrapped and recycled after they'd served their purposes. This particular example was rescued by a Kenner employee who pulled it from a scrap heap composed of many similar molds because he had saved the pattern and thought the mold would make a nice companion to it. More photos and information about the pattern for this piece can be found here.